History and peculiarities of a bubbly wine! Lambrusco is definitly the top quality wine in southern Mantuan Po. Here it finds its greatest expression thanks to clavey grounds, rich in moisture. From Ruberti to Maestri, getting through Salamino and Marani, every current Lambrusco variety is controlled by a set of rules careful to terroir, for the benefit of unique and prestigious wines. 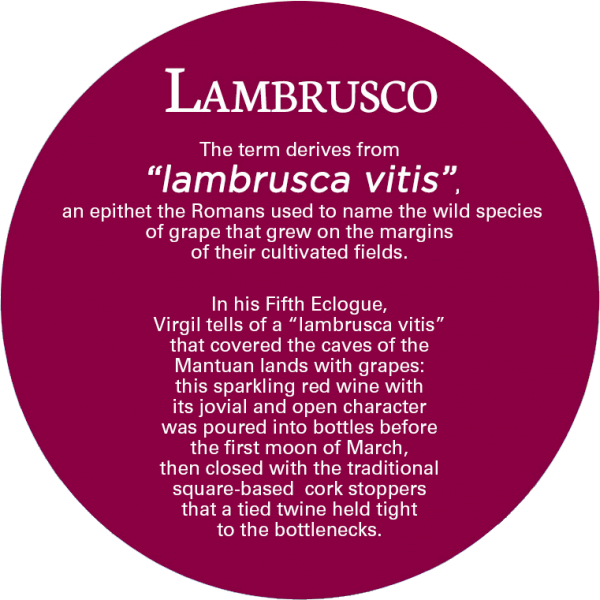 In 1987 Lambrusco got the registered designation of origin (DOC), thanks to passion and professionalismof Mantuan vine-dressers. Mantua is the cradle of these vineyards and age-old traditions: find out here our origins and some news about Mantuan recipes and customs. This traditional Mantuan cake, also known as “torta con l’uva” or cake with grapes, is made in autumn during the period of the grape harvest. In fact, the preparation of the Buffetta cake requires both the red and white grapes that are picked in the Mantuan countryside between September and October. A traditional recipe of the Mantuan Oltrepò area that consists of pressed grapes and filtered grape must mixed with white flour and boiled until becoming a sort of custard that melts in your mouth. It is delicious to eat both hot, freshly made, and cold, to serve as an alternative dessert at the end of the meal. The Quality Management System applied to the Gonzaga Winery complies with UNI EN ISO 9001:2008 standards and is aimed at the maintenance, control and constant improvement of our working methods. The organic products of the Gonzaga Winery are in conformity with the standards established by Reg. UE 203/2012. In the vineyards, the vines are cultivated without the use of synthetic chemical substances; while in the wine cellar, the vinification is carried out using only enological products and the procedures authorised by the regulations. .